Health Literacy Partners is a health literacy consulting business created by Dr. Terri Ann Parnell. Dr. Parnell is an industry expert that specializes in health literacy, consulting with a variety of industries associated with health care on providing solutions for promoting effective communication, cultural competence and language access skills to enhance health outcomes and health equity. Although Dr. Parnell is a national expert in the field and an award-winning author, she was looking for a more strategic plan for her marketing efforts. Also, she wanted to create a distinct and professional brand image and didn’t have the means for developing graphics to include with her newsletter. We developed a content marketing strategy that integrates the e-newsletter with her blog. We have a team approach to the monthly content—the Mail on the Mark team and Health Literacy Partners have a brief meeting to discuss and approve topics and timeline. Each article is drafted, reviewed and formatted with accompanying graphics. We send the e-newsletter and also create a blog and update social media channels. 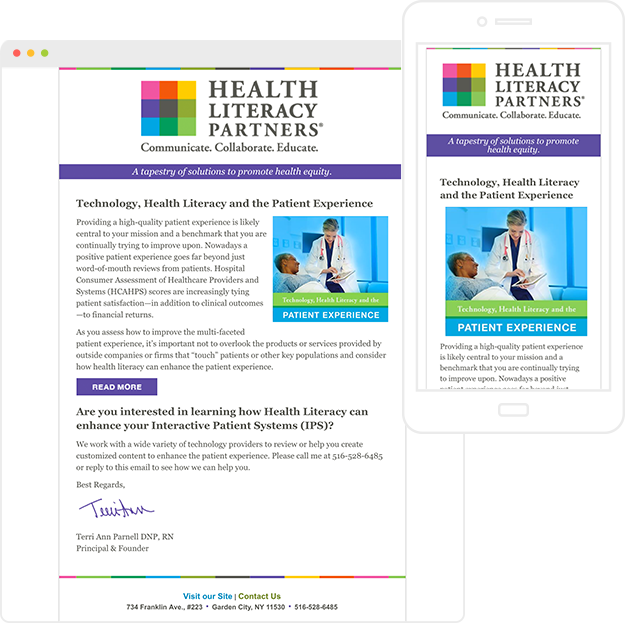 Additionally, Health Literacy Partners uses Mail on the Mark’s auto-responder feature to provide gated content as part of an effort to increase the email subscriber list. Health Literacy Partners now has an integrated and consistent content marketing strategy. By linking the e-newsletter to the blog, we are able to get better insights into click-thru rates. The e-newsletter keeps her top of mind with known prospects and the blog improves SEO for her web site. We have writers who are capable of writing about niche industries including healthcare, technology and accounting. All of our writing is completely customized. Health Literacy Partners uses Mail on the Mark’s autoresponder feature to automatically email resources to new subscribers. Providing gated content is a proven way to increase your email subscriber list. Even if you are an accomplished writer, we can help you think about your newsletter as part of a complete, content-driven marketing strategy.